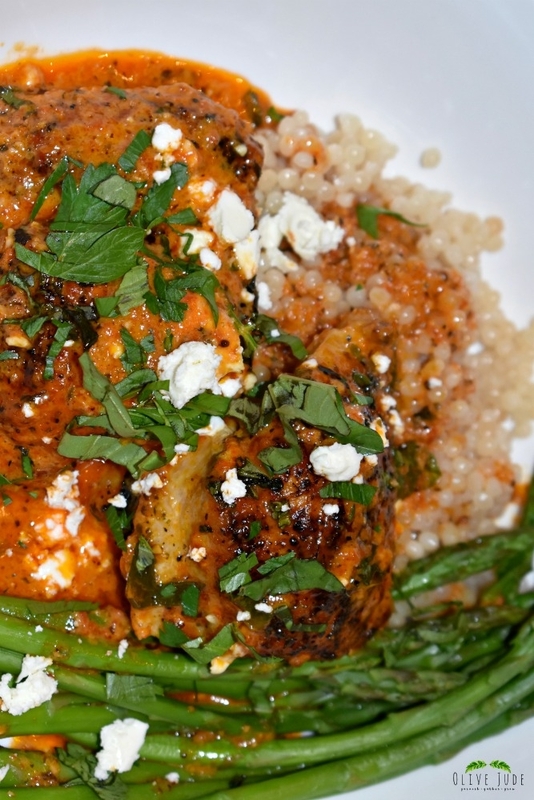 This roasted red pepper sauce coats the chicken and packs so much flavor in just one dish. Winner, winner! One pan chicken dinner! It starts with the cast iron skillet. I love her so. She can sear, sauté, stir-fry, and braise, and even go in the oven for baking and broiling. She’s a queen in my kitchen, especially for one-dish cooking and she has a permanent spot in my home. And then there is the chicken. 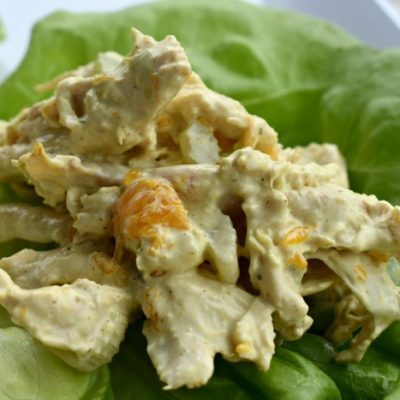 Chicken is obviously one of the easiest meats to grab at the grocery store and whip up. I’m pretty happy with a plain old seasoned piece of chicken, but if I’m going to dirty a skillet, I may as well go ahead and dirty it with some amazingly delicious sauce that you can devour with a spoon. These Rao’s Roasted Peppers are unlike any other. Sweet golden raisins and earthy pine nuts are combined with the peppers and add a special depth of flavor. I’m addicted. I start with chicken thighs. I’m a thigh girl. I don’t like my own thighs, to say the least, but chicken thighs, absolutely. 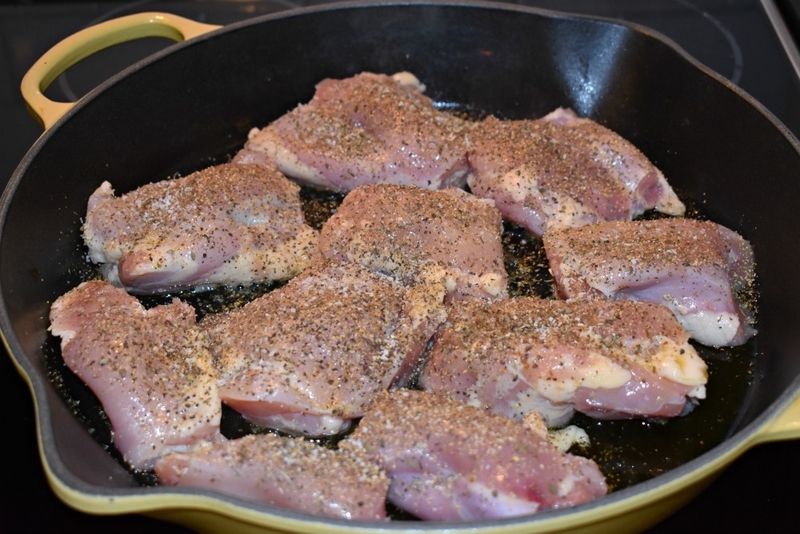 While my seasoned chicken thighs get a good sear on both sides, I add the roasted red peppers, garlic, olive oil and more seasoning to a food processor. Browning the meat in the pan adds all that roasted chicken flavor, seasoning the skillet before I even start the sauce. Once browned, I remove the chicken and set aside. Then I make some magic happen. 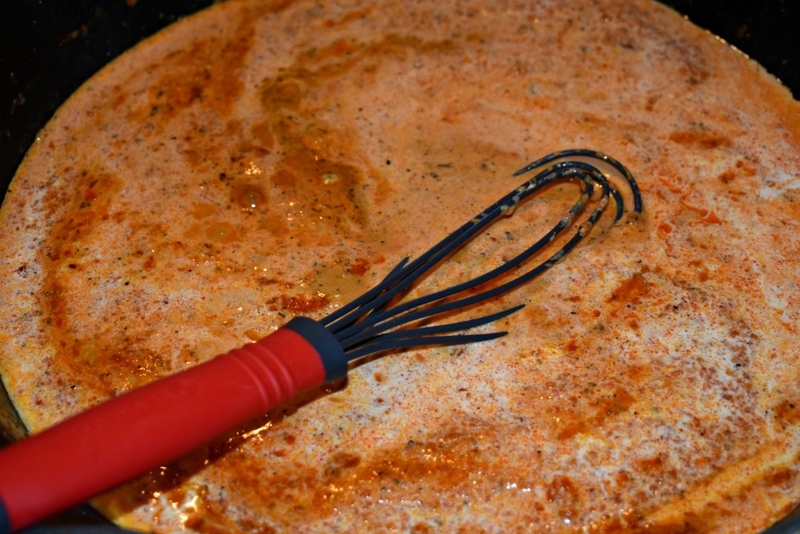 The puréed sauce gets whisked together with heavy cream right in that hot skillet. 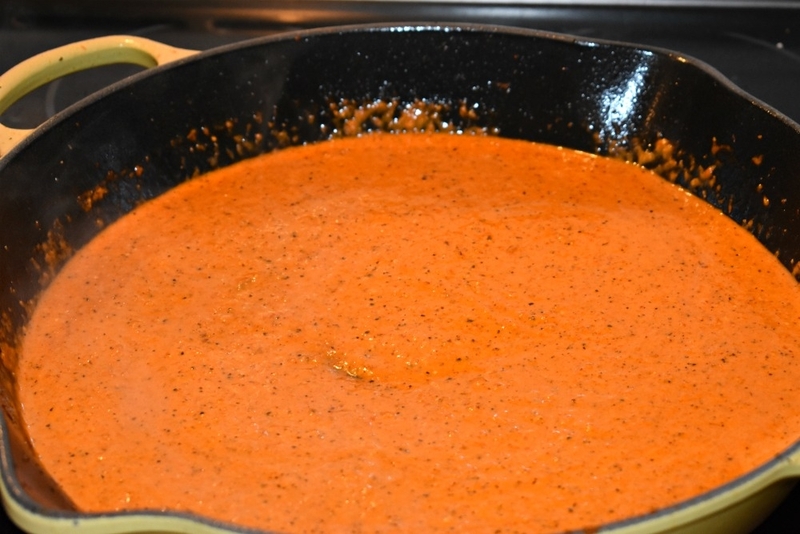 Yes, I said heavy cream, which is probably the reason I don’t like my own thighs, but I’ll get over it, because I need this incredibly creamy and rich roasted red pepper sauce in my life. You will too. I promise. Once the sauce is combined, I add the chicken and all its juices back to the skillet, making sure to toss and coat it in the dreamy sauce. Fresh herbs and feta, ’cause it’s betta’, top it off and the skillet goes in the oven for another 15 minutes. 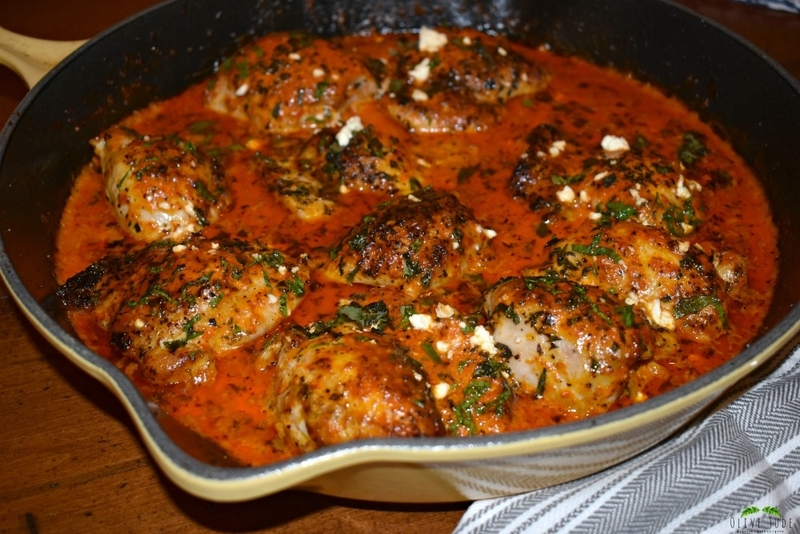 Finishing the entire dish in the oven makes this one dish meal oh so easy. I also get to clean up my splattered surface, sneak in a little couscous and steamed veggie on the side and set the table. To serve, I add a few more herbs and more crumbled feta for garnish. And then, you’re going to want to grab a spoon because a fork and knife won’t be enough. 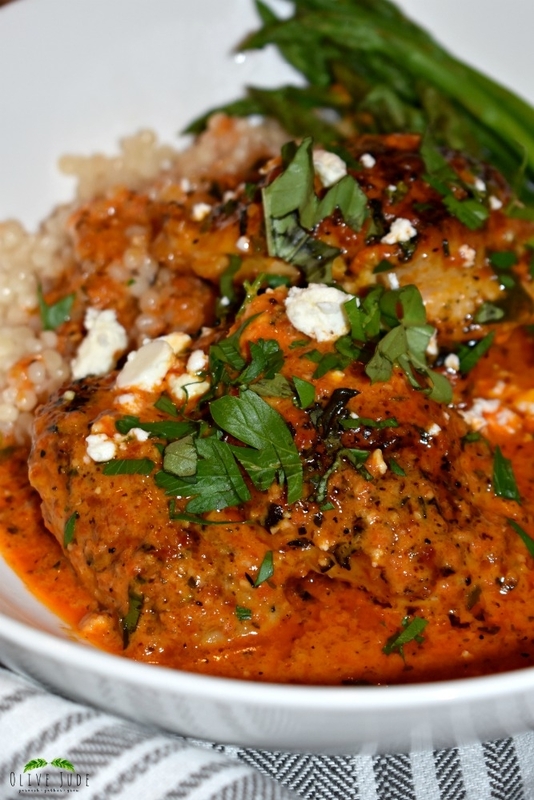 The mediterranean touches in this dish are so satisfying! 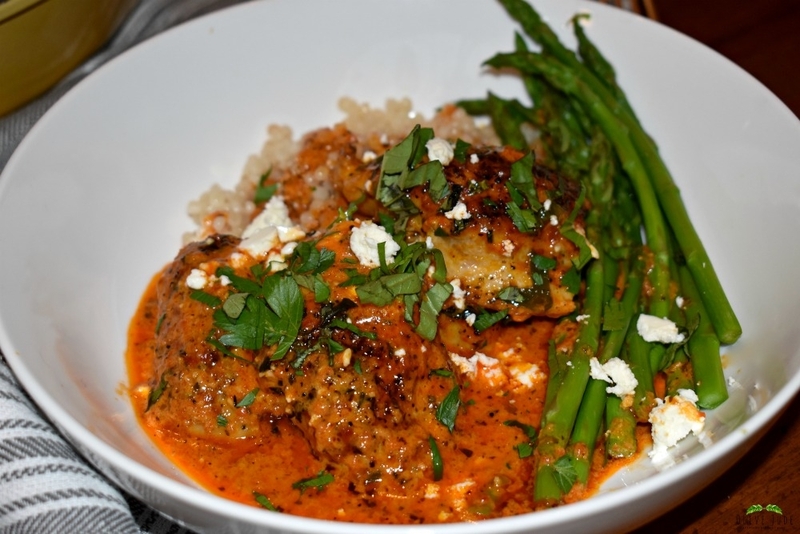 The feta has melted into the sauce, the herbs stand out, the chicken is moist, and most of all the red pepper sauce is packed full of winning flavor. It doesn’t get much easier than a sauce coated chicken, cooked in one pan and on the table in half an hour. 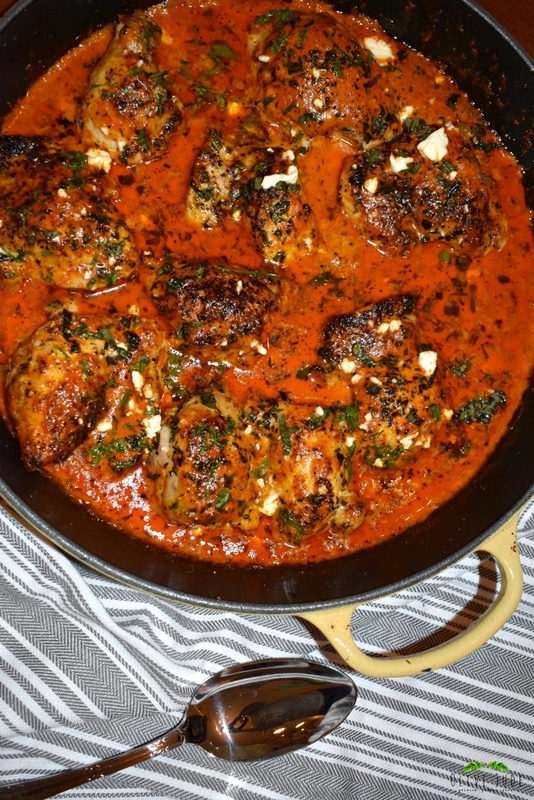 Herb and White Wine Chicken Thighs. Do you use a cast iron skillet for one dish dinners? 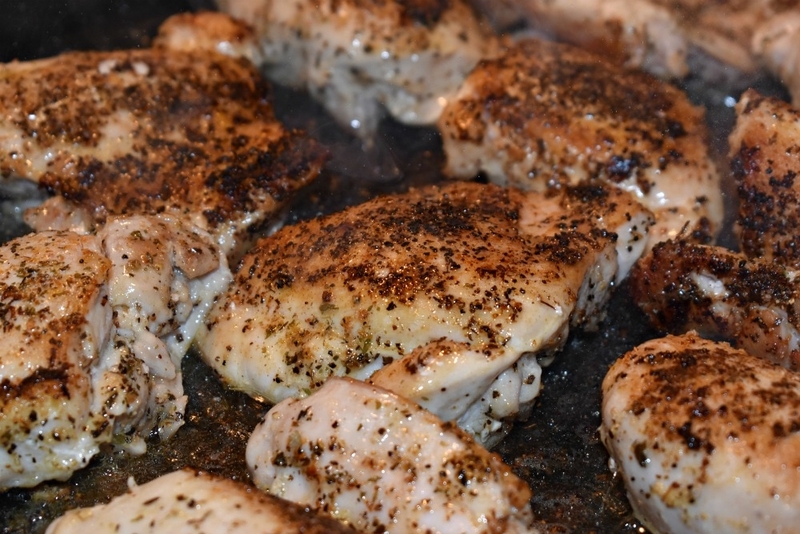 Sprinkle salt, pepper and seasoning on chicken thighs. In a hot oven proof cast iron skillet, heat olive oil over medium-high heat. Brown chicken thighs on both sides, about 3-5 per side. 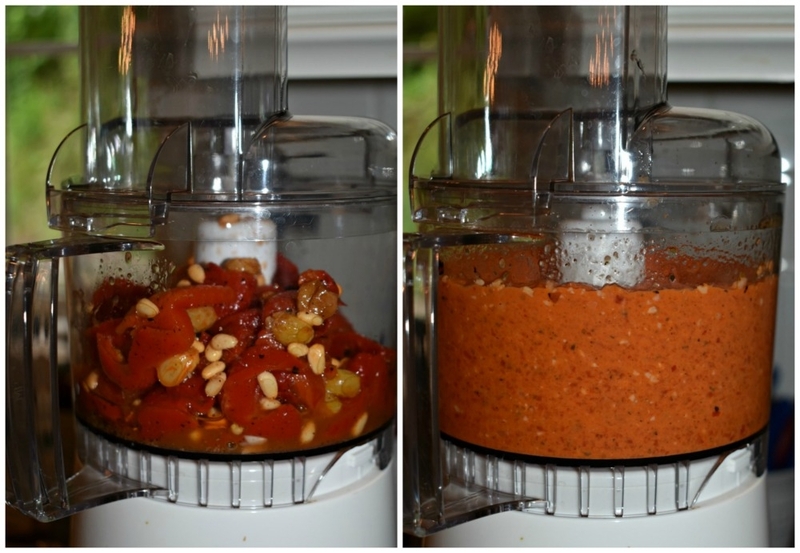 While chicken is browning, in a food processor, combine the peppers, seasoning, garlic, and olive oil. 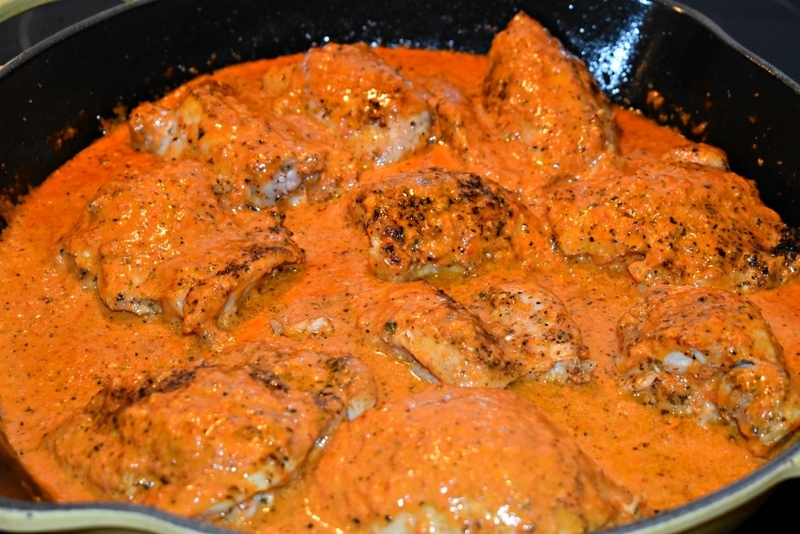 After removing the chicken, turn off the heat and add the red pepper sauce to the pan. Whisk in the cream and combine well. Add the chicken and its juices back to the pan, giving the chicken a turn to coat on all sides. 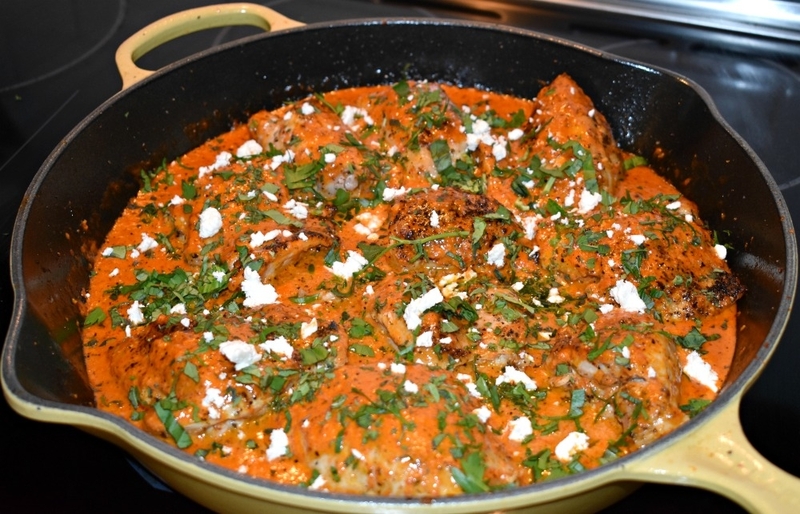 Sprinkle some fresh herbs and some feta (desired amount) over the top. 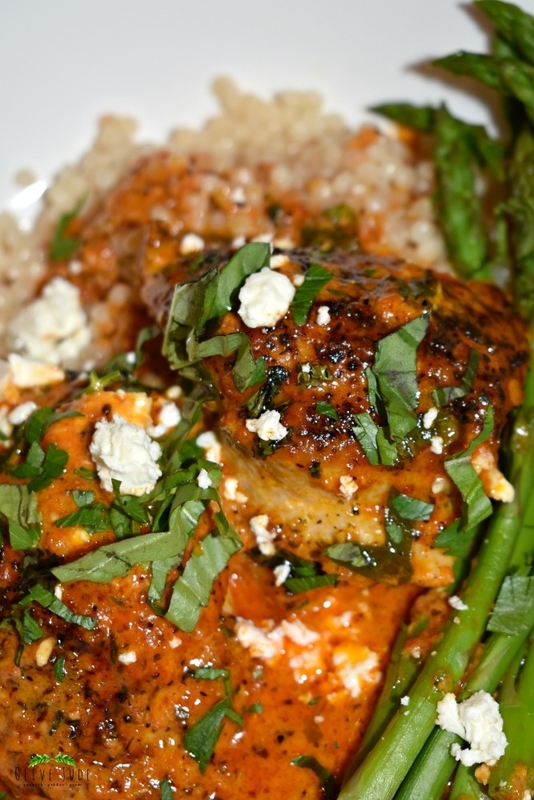 Serve with couscous and a steamed vegetable for a complete meal. For a little heat, add some red pepper flakes. Yum! This looks so flavorful and comforting! I love my cast iron skillet, too, lol! It was! Thanks so much for stopping by! Made this last night – wow! It was delicious! Whole Foods didn’t have Rao’s roasted peppers so I used another brand this time but I am going to search for it for next time! I’m so happy to hear this! Thank you! I bet any roasted peppers are delicious, I just love the raisins in the Rao’s. Thanks for sharing! 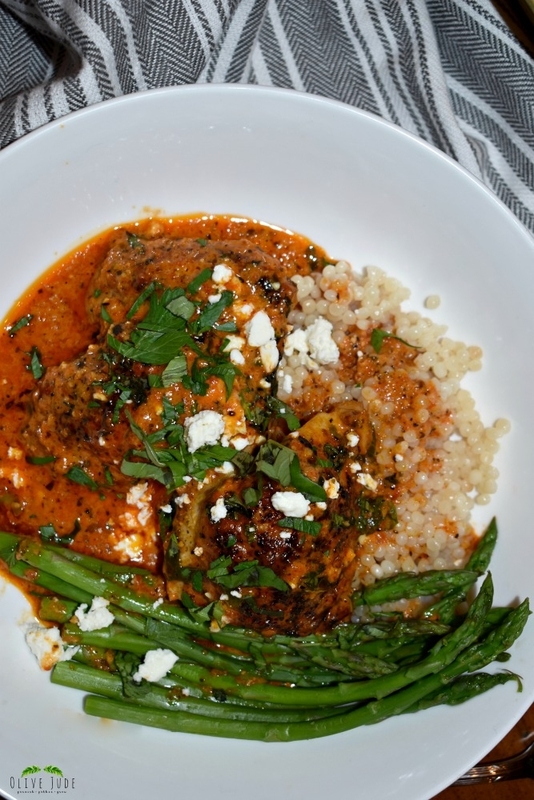 We made this tonight and – wow – that was so good. We didn’t even make it with the Rao’s red peppers (couldn’t find them). It was so good that I can’t imagine the next level flavor with the Rao’s. Thank you for another great recipe!! This looks awesome, I’ll have to try it! Made one of my goals to try at least one new recipe a week so always searching for ideas! I’m loving that goal! Hope you enjoy this comfort food! YUM! This looks amazing! 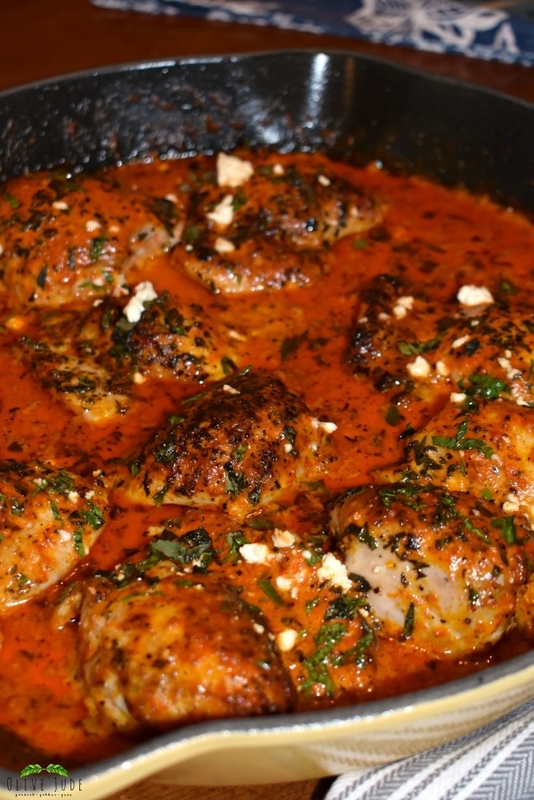 I love cooking with chicken thighs! This sounds amazing! I will have to look for those red peppers. I hope you find them! I really prefer them in this dish to other jarred peppers. Thanks for compliments! I wish my dinner looked like this every night. 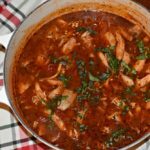 I love the use of chicken thighs and how simple this recipe is. I love when a dish is so easy, but so pretty too! This looks delicious! I have never heard of Rao’s but it sounds like there is everything in it to make a delicious sauce. Pinned to try later! 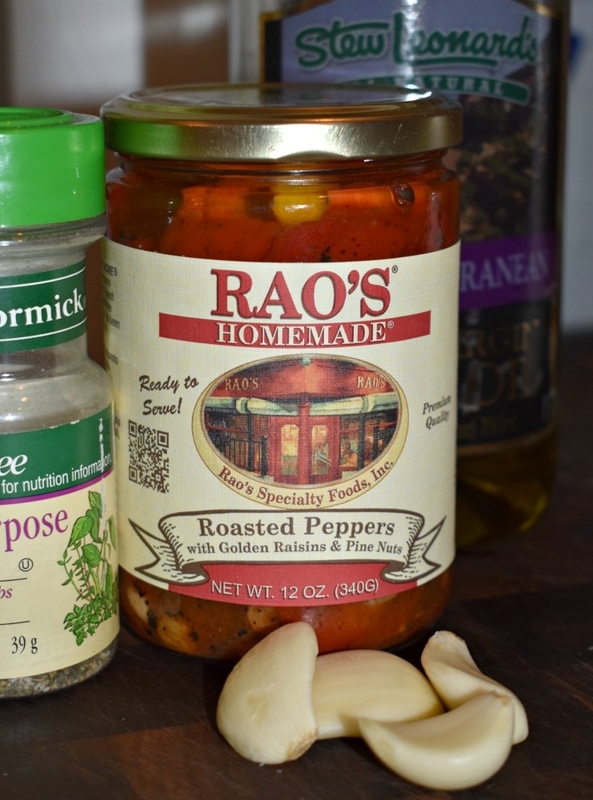 Rao’s makes my favorite jarred sauce so when I discovered their Roasted Peppers, I knew they were going to be delicious. Hope you can find them in your store-they are fabulous! 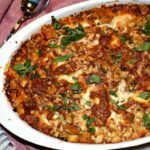 How do I make a good quick reference of your recipes? Via email? I want to be able to access the ones I save – quickly. Sorry. I’m technically challenged. Please advise. These chicken thighs look awesome. And I dont want to interrupt you when you’re queen of the court ??? ?